I spent a fair amount of class time tonight discussing with my students the novel we’re reading this semester, “The Kite Runner” by Khaled Hosseini. It seems that most are enjoying the book (or so they tell me) and it is exciting to see these *non-readers* anxious to talk about a book! I think it was a good choice, despite my misgivings about the sometimes uncomfortable to discuss (in a roomful of college-age students) subject matter. They are handling it well and maturely. We are counting down now to the end of the semester and a well-deserved break! This weekend the DH and I started work to close up the pond for the winter. This involves scooping out any leaves that have managed to find their way in, sinking the hardy plants down to the deep end of the pond, and removing lots of accumulated stuff (fish poop?) that litters the pond bottom. Despite the cooler temperatures and decreased sunlight my new water lily is still blooming. This chore is kind of depressing and sad because it means the summer is gone. It also makes me remember all the grand plans I had for the pond this past spring, most of which I never got around to. That’s one thing about keeping a pond – it is always a work in progress! And I can spend the winter planning for next spring. For now the goldfish are slowing down, still friendly at the pond’s edge, but not begging the way they do in warm weather every time they see your shadow go by. I had to be careful when scooping out the leaves and stuff on the bottom because once or twice I scooped up an already sleeping fish in the net. What puzzles me are the frogs. 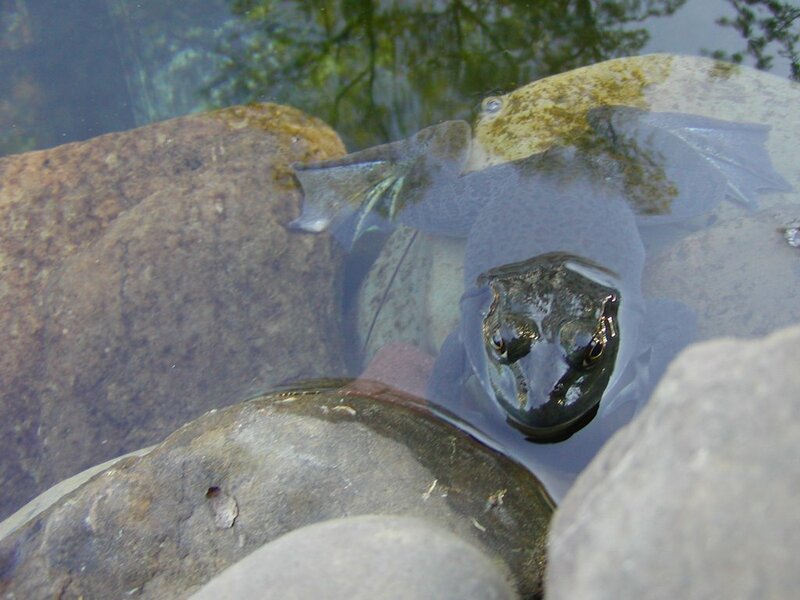 When we first put in the pond we added a few tadpoles for fun – some just seemed to vanish and others grew into big bullfrogs like the one in the photo. We’ve had a few little green frogs show up from nowhere. But I never can find them in the fall when we do clean up, nor in the spring when we start the pump and filter running again. I’m not sure where they go to spend the winter. I thought this might be a fun diversion from all the things I should be doing; like laundry or schoolwork. I’ve always wanted to be a person who enjoys writing and who writes daily. Maybe this will help. It does take a commitment to write everyday. I envy people who do. Not sure what I will post here aside from random thoughts and photos. We’ll see. 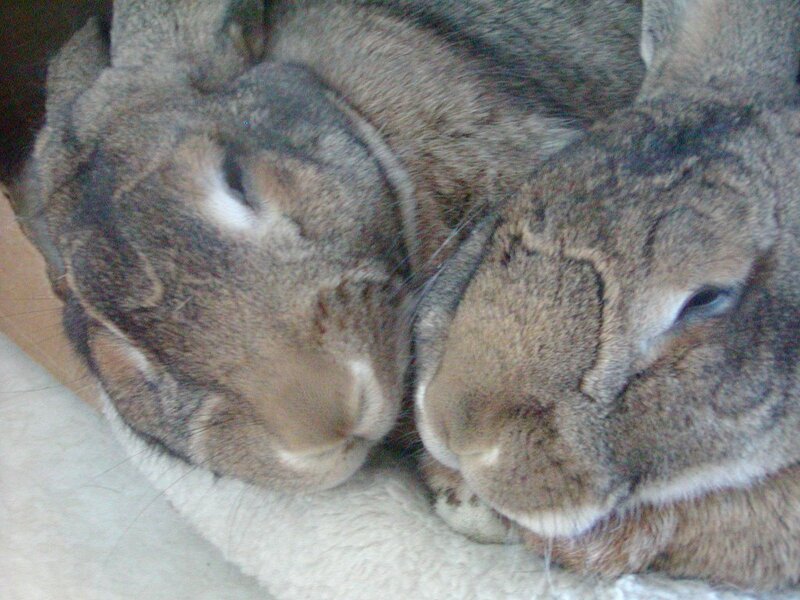 Today’s photo is a favorite of Boomer and Cricket. Typical of how they spend their days. Not a bad life, right?